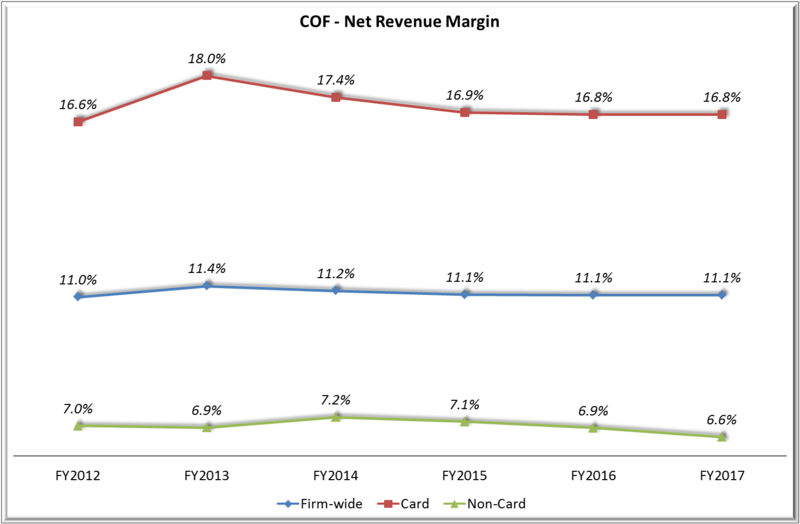 We expect positive revisions to 2017 eps estimates for COF from $8.60 to $8.80 given the mix-shift to card (where average balances are growing 10%+ versus 5%- for non-card) and where the revenue-margin at just under 17% is more than double that for non-card (chart below). CEO Richard Fairbank indicated last December that “what we are originating now [in card]… its revenue margin is pretty similar to our existing book” and we expect the mix-shift benefit, along with a lift from home-equity run-off, to overcome headwinds to firm-wide revenue margin (drag from payment protection, compression in auto and commercial). Specifically, assuming a flat card margin, consensus seems to call for a sharp decline in non-card margins to 6.6% in 2017 from 7.1% in 2015; we allow for a less severe decline to 6.7%. COF earnings are highly-sensitive to the revenue margin so that our 2017 eps estimate of 20c above consensus corresponds to just an incremental 6bps on net revenue margin on a base of 11.1%. We assume no operating leverage (because of investment in compliance and digital capabilities) and negative credit leverage (e.g. because allowance-builds are front-loaded). We align with consensus in that stock buyback will lift eps by ~5% requiring the net payout ratio to increase to 80% in 2017 (from nearer 60% in 2015 and 2016). This reflects over-capitalization at COF with a CET1 ratio (standard, transitional) at 12% versus the regulatory minimum of 8%. Some of the excess will be absorbed by increased risk intensity (e.g. risk assets up 9% in 2015 vs. 6% for GAAP assets) given a shift to loans from securities and given parallel run which the firm entered at the beginning of the year, and some by migration to a fully-phased advanced approach. Nonetheless, we estimate COF has 150bps of excess capital and will utilize 50bps of this excess in 2016 to hold the net payout ratio at ~60% and a further 25bps in 2017 raising the payout ratio to 80%. Credit, particularly the dynamics for the loan-loss allowance, is a wild card for COF earnings. As CFO Steven Crawford commented in June “the best person in consumer credit would tell you that beyond six months it’s hard [to forecast the allowance] and even minor changes in the loss rates have a big impact on provision”. We model an increase in the allowance, as a proportion of gross loans, to 2.5% in 2017 from 2.3% today as loan growth moves towards a more steady-state after the sharp increase in 2015 (when the ratio increased 25bps); along with estimates for rising loss ratios, in line with management guidance for card, this means that growth in credit provisions will slow to around 10% from 30% in 2015. The base investment case for COF is that projected (tangible) return-on-equity of 13.5% merits a 1.5x multiple of end-2016 tangible book of $61/share for a valuation of just over $90, or ~10.5x consensus estimates for 2017 eps of $8.60. We expect valuation upside from this $90 target with positive revisions as the portfolio mix-shifts to card lifting estimates for profitability. 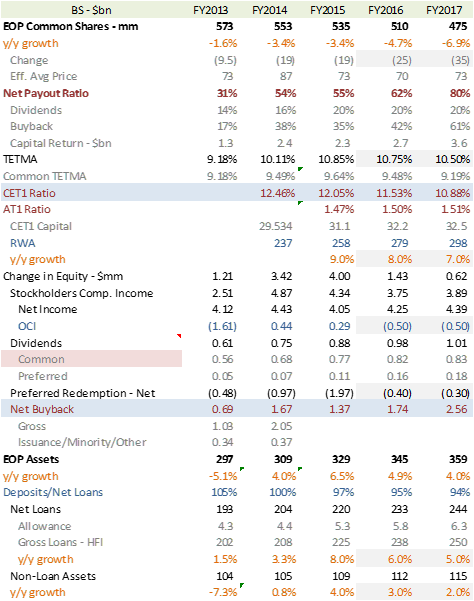 We expect positive revisions to 2017 eps estimates for COF as the portfolio mix-shifts to card (with average card loans likely to grow over the next 2 years at 10%+ versus 5%- for non-card) lifting firm-wide revenue margin which, at a segment level, is more than double in card than non-card (Exhibit 1). A key assumption is that the card-segment margin remains stable despite the small drag from payment protection whose contribution (~25bps for FY2015) is guided to zero by FQ22016. The longer-term effect is the economics of new vintages versus the back book, and CEO Richard Fairbank indicated last December that “what we are originating now … its revenue margin is pretty similar to our existing book”. We also assume the margin-benefit of mix-shift to card is not drowned by margin-compression in the auto- and commercial portfolios albeit offset by home-equity run-off. The earnings model is highly sensitive to the revenue margin with each change of 5bps worth just over 15 cents in 2017 eps (on a base of $8.60). Consensus appears to be forecasting the firm-wide revenue margin flat at 11.10% and we allow a lift of 6bps in 2017, after the payment protection affect is run through in 2016, for the card mix-shift generating 2017 eps of $8.80 up 20 cents from consensus (Exhibit 2 – next page). We assume no operating leverage (because of investments in compliance and digital capabilities) and negative credit leverage (e.g. because allowance-builds are front-loaded). While negative credit leverage tends to reduce the return-on-assets, the key driver of the decline in tangible return-on-equity from ~15% in 2015 to ~13.5% in 2017 is deleveraging of the GAAP balance-sheet as the ratio of tangible equity to assets increases to 8.9% from 8.4%. This is despite the fact COF is over-capitalized on the risk balance-sheet with a CET1 ratio of 12% (standard, transitional), versus the regulatory minimum of 8%, that is modeled to fall to just under 11% by 2017 (Exhibit 3). The reason for the different dynamics is that risk assets are increasing faster than GAAP assets: 9% in 2015 (period-end) versus 6%. In part, this is because loan growth at 8% is outpacing non-loan growth and in part it is because regulators are increasing risk-intensity likely related to Capital One’s entry to parallel run at the beginning of the year. The glide-path of the CET1 ratio is a key variable for the net payout ratio and, hence, the stock count which consensus calls for contributing over 5% to eps growth in 2016 and 2017. The ratio will decline as COF moves from a standard, transitional computation to the advanced fully-phased approach but there likely remains excess capital of at least 100bps even allowing for a 50bps buffer over the minimum requirement of 8%. We note that, in its self-reported mid-year stress test, COF computed a 2.5% decline in the (standard) CET1 ratio from actual to stressed-minimum consistent (since the formal stress test conducted by regulators uses the standard, not advanced, approach) with the estimate of a 1.5% excess. We expect management to utilize 50bps of this excess in 2016 to hold the net payout ratio at ~60% and increase risk-leverage by a further 25bps in 2017 thereby raising the payout ratio to 80%. In each year, we allow for $0.5bn negative marks on the securities portfolio to flow to CET1 capital other comprehensive income (OCI) as required in the fully-phased (but not transitional) basis. Finally, while management has indicated a prioritization for capital-return for share repurchase (because of its flexibility) over dividends, we assume annual dividend increases in line with the past two years. Credit, particularly the dynamics for the loan-loss allowance, is a wild card for any COF earnings model. As CFO Steven Crawford commented in June “the best person in consumer credit would tell you that beyond six months it’s hard [to forecast the allowance] and even minor changes in the loss rates have a big impact on provision”. The firm’s methodology is to model the allowance in line with 24-month forward loss estimates but it remains subject to a wide and irreducible error bands. This matters because the stock can over-react to negative provision-surprises, as when the second quarter results were released on July 23rd, when related to seasoning effects (including the front-loading of allowances on fresh vintages) rather than providing a signal on over-the-life loan economics or changes in the ambient credit environment. We model an increase in the allowance, as a proportion of gross loans, to 2.5% in 2017 from 2.3% today as loan growth moves towards a more steady-state after the sharp increase in 2015 (when the ratio increased 25bps); along with estimates for rising loss ratios, in line with management guidance for card, this means that growth in credit provisions will slow to around 10% from 30% in 2015.